May 6, 2014 - The National Transportation Safety Board (NTSB) today issued nine recommendations addressing the need to provide more comprehensive preflight weather information to pilots. The recommendations were issued to both the Federal Aviation Administration (FAA) and the National Weather Service (NWS), who are jointly responsible for providing such information to pilots. Timely, detailed weather information is critical for enabling airmen to properly balance risks and make sound decisions when determining to fly. The recommendations are based on NTSB accident investigations involving aircraft encountering weather conditions, such as adverse surface wind, dense fog, icing, turbulence, and low-level wind shear. Currently, although information on these conditions may exist, it is not always provided to pilots through NWS products during preflight weather forecasts. "What's difficult to understand is why weather advisories from the National Weather Service to the general public, at times, provide more comprehensive information about weather conditions than the advisories they provide to pilots experiencing the same conditions," said NTSB Board Member Earl Weener. "Why pilots would receive less information makes no sense, and increases the risk of flying in severe weather conditions. That is why this issue is on the NTSB's Most Wanted List." Additionally, although the NWS routinely advises pilots of turbulence and weather patterns associated with mountain wave activity (MWA), which can cause unique and adverse flying conditions, there are currently no requirements for the NWS to issue advisories specific to MWA. The NTSB believes notification of the potential for and the existence of MWA allows pilots to prepare for these atmospheric disturbances. The NTSB also identified the need for improved situation awareness and communication between the center weather service units (CWSUs) and the Aviation Weather Centers. Appreciating the challenges involved in issuing critical weather advisories in a timely manner, the NTSB recognizes the importance of proper coordination and communication between the various NWS components. 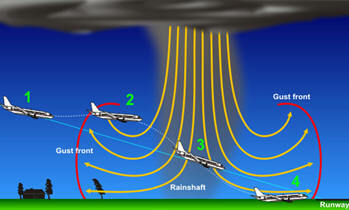 Therefore, the NTSB is also recommending a protocol be established to enhance communication among meteorologists to ensure mutual situation awareness of critical aviation weather data among meteorologists. "Safety will be enhanced for airmen and their passengers when pilots are given a complete weather report including all of the most current weather information," Weener said.